This week’s soup began like so many others in this blog, at Caputo’s. This ethnic Italian grocery store has some of the best produce in town, even better than Whole Foods most of the time. Their stuff is interesting too. It reminds me of the Jon’s in my old neighborhood in Los Angeles. Jon’s had terrific fresh herbs and a great variety of really cheap vegetables all year round, not to mention the fabulous deli with all its ethnic Armenian meats and cheeses. Caputo’s, on the other hand, has great dried herbs that are essential to getting through the Midwestern winter. It’s been something of a lesson for me in making do with what I’ve got, a lesson my nostalgic mind is still not happy with. Jon’s was the place I found bags of loose beets and multiple bunches of fresh dill so I could make my first borscht. It’s where I stocked up on those big three pound tubs of feta cheese my wife hated so much. The source of my spinach and feta cheese quiche, Spanakopita and the soups that sprang from these dishes. Visiting Jon’s was like entering another world, (Have you ever found tarragon soda on your planet?) a world I still miss from time to time. So when I saw the beets at Caputo’s last week, that’s what rushed through my mind. It jump-started a road trip through my culinary past, but it wasn’t going to do me any good with this blog: I’d already made a borscht for this blog (See?) and what else do you do with this stuff? Well, I bought them anyway. Call me stubborn. Call me foolish. Or maybe just hopeful. It’s a feeling I hadn’t had for a while, so I went with it. A few days later, when I came across the beets in my fridge, I decided to roast them and see what happened. When they came out, they had the consistency of really good roast potatoes with a beety tang and a note of caramelized sugar. It just needed something to offset the beets. That’s when I remembered the wonderful beet salad my wife discovered in Alice Waters’s Chez Panisse Cafe Cookbook a while back . It features beets, feta cheese and avocadoes tossed in a garlic balsamic dressing. We love the salad, and the dressing has been my wife’s go-to salad dressing for several years now. The beet-feta combination got me thinking. I put the beets in a pot, added stock and a dried little rosemary (Sorry, I’m in the Midwest), folded in the feta cheese, simmered for a while, then pureed the whole thing. The result was a bit rustic so I added some milk and cream cheese to smooth out the texture and finished with another 8 ounces of feta to add some for that contrast I mentioned earlier. The soup turned out great. My wife, the feta cheese hater, loved it. And my youngest, the beet hater, called it a great soup “for a person who doesn’t like beets.” I think she meant it as a compliment and I’m taking it. After all, I’m not Alice Waters. Nor am I in California anymore. But that doesn’t mean I can’t make something great with what we’ve got here in the Midwest. Preheat the oven to 350 °F. Toss the beets in the canola oil and some salt and pepper, spread them out on a sheet pan and roast them for about 45 minutes. Put the beets into a 3 quart soup pot with the rosemary, chicken stock and four ounces of the feta cheese. Bring the soup to a boil then reduce it to a simmer for 20-30 minutes. Fold in the cream cheese and milk and puree the soup until it’s nice and smooth. Heat the soup through, crumbling the remaining eight ounces of feta cheese into the mix for additional texture and bursts of flavor in every spoonful of soup. 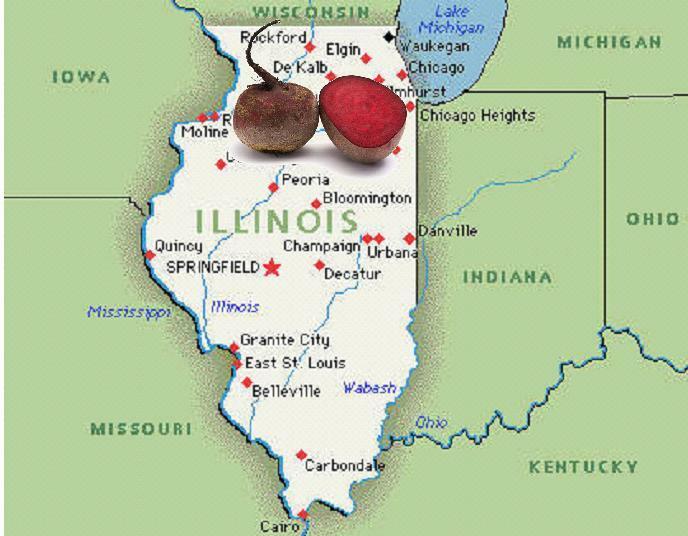 Image Credit: “On the Midwestern Beet,” by the author. If you want turn your hands purple, peeling beets is the way to go. So good, in fact, that beet juice is sometimes used as a natural dye. That’s my way of saying don’t spill this soup on your nice white pants, it also absolves me of any liability. I’m not going to make you sign a waiver or anything, but you could leave a comment. I love the mangel wertzels (see Jitterbug Perfume) they are great for everything! Remember you have eaten them the next day or you may call 911 ; ). Who woulda thought..beets and feta?? This soup is delicious (and a pretty color to boot!) Thanks Phil, I wasted no time in taste testing. Mainly I hate the giant tub of feta that takes up a whole shelf in the fridge. Gad, what salad will be soup next–readers guard your lettuce!